Burnley have appointed ex-Watford boss Sean Dyche as their new manager on a two-and-a-half-year contract. Dyche, who was sacked by Watford in July, takes over with the Clarets lying 14th in the Championship and five points away from a play-off position. In his only season in charge of Watford, Dyche guided the Hornets to 11th position in the second tier. 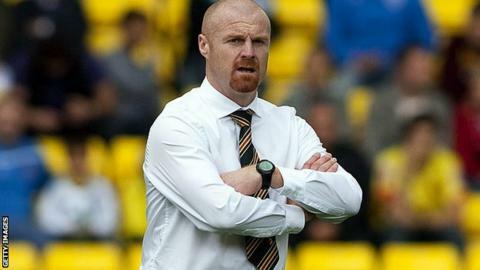 and were among those linked with the vacancy at Burnley, but the Lancashire club have turned to Dyche to lead them into the Championship promotion race. Co-chairmen John Banaszkiewicz and Mike Garlick issued a joint statement welcoming Dyche to Burnley. It reads: "Sean was the outstanding candidate following an extensive and structured interviewing process to find the right manager to fit in with our vision for the club. "He is a natural leader with real presence who did a marvellous job at Watford last season. "His commitment to a very strong and successful youth system was clear at a club with close parallels to our own. Sean is especially keen to develop stronger links between Burnley Football Club and the local community. "These attributes, complemented by a fantastic ability to maximize resources in taking Watford to their highest position since relegation from the Premier League in 2008, make us confident Sean is the right man to take this club forward." Youth team coach Terry Pashley won the first two of his three matches in caretaker charge of the first team, but his temporary reign ended with a on Saturday. The first task for Dyche, a centre-back who made 521 appearances for six different clubs during his playing career, is to decipher the reasons for his new club's defensive frailties this season. The Clarets have conceded 29 goals in 13 league games - the worst record in the Championship. His first game in charge will be a home fixture against Wolves on Saturday, while his former club Watford are due to visit Turf Moor on 15 December.